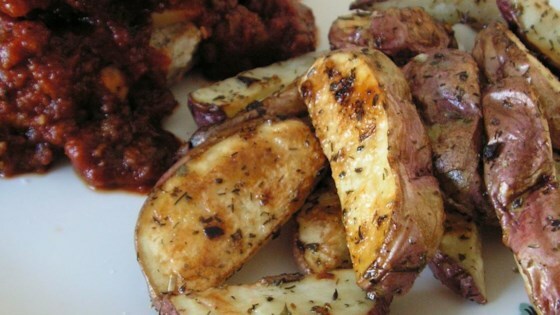 "A great roasted potato side dish made with olive oil and herbs." Preheat oven to 475 degrees F (245 degrees C). In a large bowl, combine oil, garlic, basil, marjoram, dill weed, thyme, oregano, parsley, red pepper flakes, and salt. Stir in potatoes until evenly coated. Place potatoes in a single layer on a roasting pan or baking sheet. Roast for 20 to 30 minutes in the preheated oven, turning occasionally to brown on all sides. Fantastic recipe! I doubled the recipe with no problems. I did microwave the potatoes (in their jackets) to reduce cooking time. Skip the peeling! The skin adds nutrients and interest!